This page will discuss the method to extend system partition when Windows Server 2008 R2 is running out of disk space on it. Download IM-Magic Partition Resizer Server to extend system partition on Windows Server 2008 R2. It is free from virus and spyware. Nobody is willing to face the low disk space problem on computer, but the problem occurs more or less during the usage of your computer. The problem happens to Windows Server users more often, because Servers usually needs more space to store data. Low disk space on Server disk partition especially on a system partition can cause some unnecessary trouble, so it is important to solve the problem thoroughly. This article will introduce IM-Magic Partition Resizer Server to extend system partition or other data volume on Windows 2008 R2. Download, install and run IM-Magic Partition Resizer. 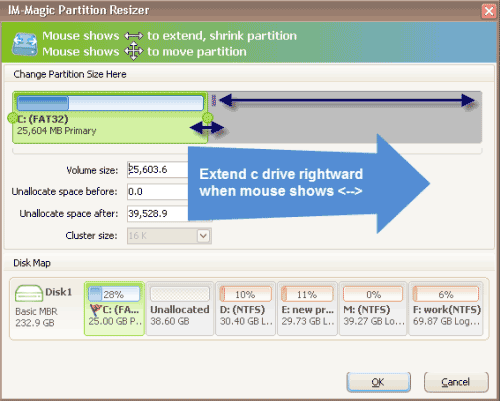 Select a partition that has enough free space and right click it, and then you can go to "Resize/Move" option. You can move the arrows to shrink the selected partition. Then, some unallocated space will be shown beside the selected partition. Move the unallocated space close to system partition. Then, right click system partition and select "Resize/Move". You can move the arrows to extend system partition and then click "Apply" button. "I have just reinstalled the operating system on my PC, during which Windows said the system partition is running out of disk space and it advised me to format the drive to free up space. I didn't backup data on system partition before system reinstalling, so I didn't format the drive. After system reinstalling, I find that the system partition only has little free space. 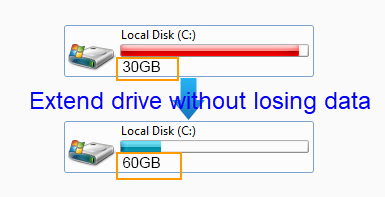 How can I free up space on system partition without formatting? My computer is running Windows Server 2008 R2 OS." "Hello! Can you tell me if it is possible to extend system partition on Windows Server 2008 R2 with Windows built-in Disk Management? When I right click the system partition, the Extend Disk Volume grayed out. I don’t know what is wrong. Can you give me some advice to extend Windows 2008 R2 system partition? " 1. When system partition is running out of disk space, you will fail to save any data or install any program on the partition. 2. The Server will run slower and slower if the low disk space problem cannot be resolved. 4. Cause some other unknown trouble to your computer. Since low disk space problem can cause so much trouble to computer, many users are unwilling to fact the problem and feel upset when run into the problem. If you don’t want to face the system partition space lack problem, you can extend system partition when it is running on low disk space. IM-Magic Partition Resizer Server allows you to move free space from other partition so that you can extend the system partition without deleting or moving any data from the partition. This software is also available for RAID 5 system partition resizing without reinstalling system or rebooting computer. If you need to resize basic disk system partition on Windows Server 2008 R2, you should ensure that there is unallocated space on the same hard disk. You cannot extend system partition by moving free space from other hard disk. If you need to extend RAID 5 system partition on Windows Server 2008 R2, you can move free space on the same hard disk. Or you can add new disk to RAID 5, and then move the unallocated space to extend system partition. 1. Partition software can help resize system partition without hurting the operating system, so you don’t need to reinstall system in order to perform partition resizing. 2. Partition software provides safe way to increase system partition size without touching disk data, so you don’t need to worry about data loss. 3. Partition software enables you extend system partition without rebooting, so you don’t need to worry that it will cause any trouble during the partition resizing due to rebooting.